here is the snippet of what people were talking about former president Dr.APJ Kalam over micro blogging site(twitter). 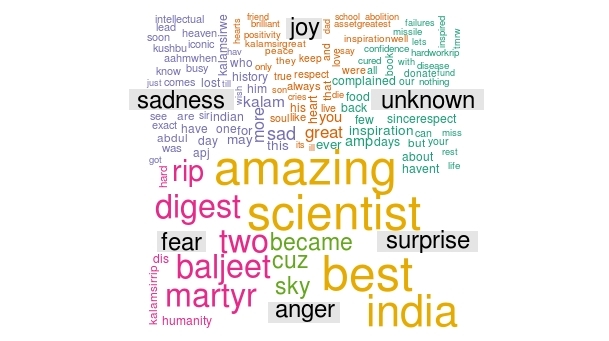 the word cloud image above light is "amazing" "scientist" "best" "india". 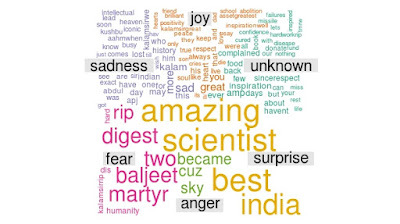 most of the tweet mentioned about Dr.APJ Kalam. next to that, more number of tweets also mentioned word's like "rip" "martyr" "great" "human"
note : Due to restriction on my twitter account, I have got only 1500 tweets from 27/07/2015. the word cloud, posted above based on the 1500 tweets.